Hi everyone, Louise (M3TLL) here. Just thought I'd share with you a radio-themed challenge I've set 2E0HTS which begins tomorrow. Every day throughout February Simon must make at least one contact on the radio. There's no conditions other than he must post the callsign, frequency and time he works the contact here on his blog. It can be any band, any time of day, any country, mobile, portable or from home. Feel free to join in his February QSO challenge or just visit his blog to see if he actually can make at least one radio contact every day. Listen out on the bands for 2E0HTS who should be more active than usual this month. I managed some nice QSOs via SO-50 earlier this evening whilst operating from my radio shack. I caught the contacts on camera as the bird passed me by at around 46º above my horizon. The video shows me working into the bird without too much difficulty running 25w from my FT-847 into my Satellite Array. During the pass signals were coming in well, I worked a total of 4 stations – CT2GOY, F0FVK, SP6XSD & EA6SWportable 6. My Daughter gets very excited when I am active on the Satellites as you can see she is taking after her Dad and straight over for some radio hi hi. I was active earlier on the Satellite bands and made QSO with F6HRO, DG1EA, IK8YSS & OH5LK all via AO-7 during a 45° Pass. During my lunch breaks from work I usually get the chance to "ride shotgun" as my YL - Louise (M3TLL) picks me up from work and brings some lunch followed by a pleasant walk with our dog Dudley and baby daughter Elsie. 4U1WRC is operated at the station of 4U1ITU (International Telecommunication Union) which is located at thier headquarters in Geneva. 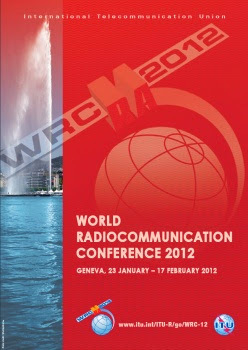 4U1WRC is only on the air from today 23rd of January until the 17th of February. There is a special QSL card to collect confirming DXCC Entity - ITU HQ EU 28 14. Lucky for me I was told by ITU Op Nic that I was the first station to work the 2012 4U1WRC station, which was pretty cool especially from my mobile station. Our QSO took place earlier today on the 20M band - 14.264MHz at around 12.12 utc. As usual the signals exchanged were nice and strong, I received Nic at 5/9+20 and my report was 5/9 solid copy. 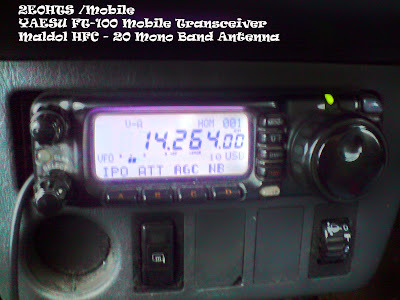 I am still running the same equipment: YAESU FT-100 into a mono Band Maldol HFC 20 antenna. I have had several years of excellent results using the same radio and antenna that I got back in 2005. I might consider changing the vehicle but the ham radio gear will be staying! 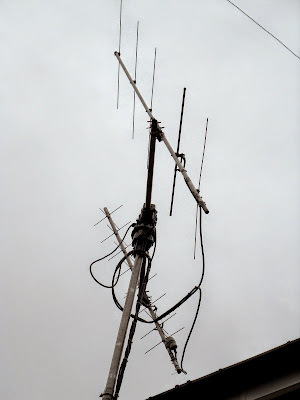 With the dark days of winter nearly over we decided to head up to our moor top retreat to check on how things have been holding up.We have been getting lots of gale force winds lately however my antennas were all where I left them and still in good shape. Our hill top holiday shack is now becoming very interesting to our 10 month old baby girl, she spent the afternoon exploring the long corridor. I got some spare minutes when she had a short nap where I managed to set up some of my other radio equipment. I shuffled my rigs around to find a pleasing lay out and then connected them up to my antennas. 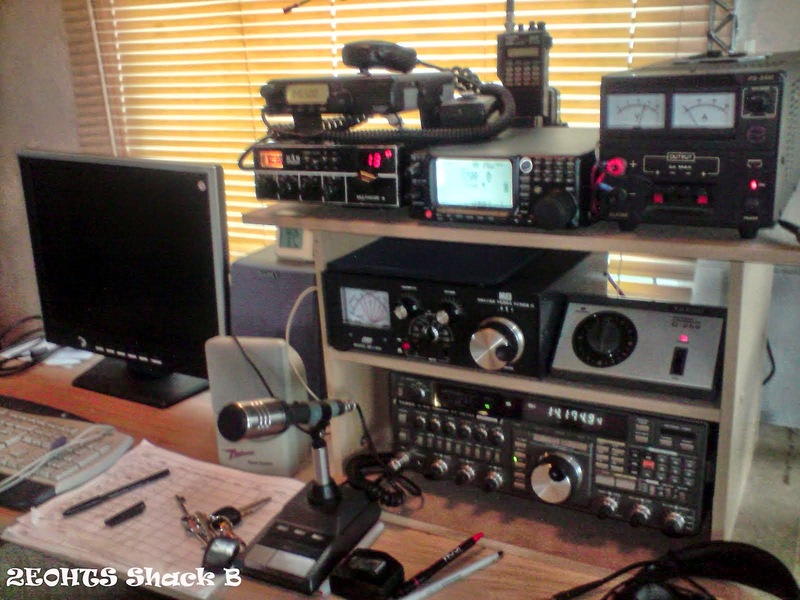 Shack B is now up and running ready for our visits up there once the WX starts to change. I stumbled across the perfect portable radio shack and would love to have it parked outside. 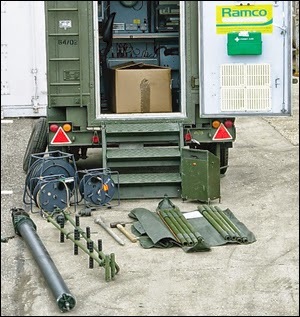 Someone will be grabbing themselves a bargain as the MOD (Ministry Of Defence) are having a surplus equipment sale. Check out National Communications Radio System Cabin for more details. I hope you are all having a great New Year! Its been a busy couple of weeks and its great to be finally back here on my old ham radio blog catching up with some of my Ham buddies around the globe. Last year I fitted a selection of wire radials covering 40m through to 20M which have now become almost hidden in the grass. If you look carefully you can make a few blue radials out at the base of the mast in the picture above. I have been making up some additional radials for my 6BTV which I cut for 20m, 15m and 10m. This time I wanted to fix them slightly above the ground so I fed them directly at the antenna base where I used a mounting bolt as a stud to clamp too. The picture above shows the new radials attached and pinned to the ground which keeps them tidy as well as trip free. THE RESULT: My Hustler 6BTV now has a few more 1/4 wave radials and is working well on transmit as well as receive. During a test transmission I recently worked Ian - VK3MO again up on 20m at about 10.30 utc. As usual Ian was 5/9+.